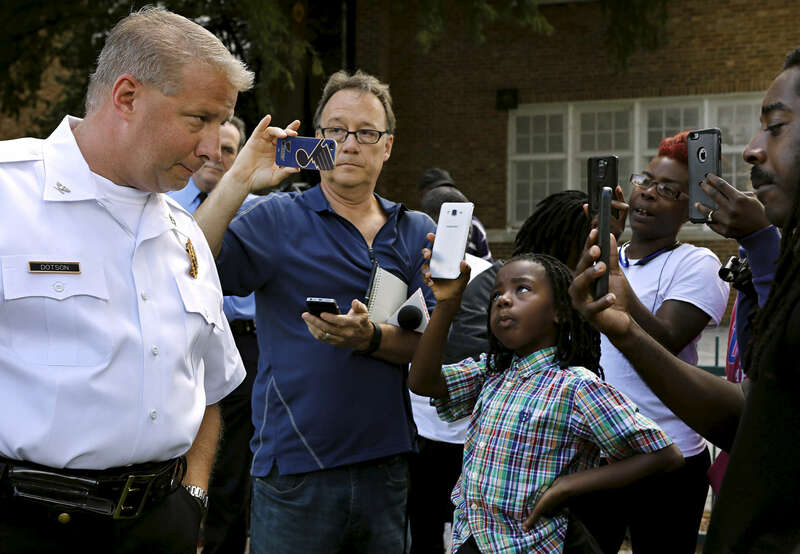 J'volte Jones, 8, holds up a cellphone to record video of St. Louis police chief Sam Dotson (left) as Dotson takes questions from the community after briefing the press about an incident where two St. Louis police officers shoot a 14 year-old boy in the 5000 block of Beacon Avenue in St. Louis on Sunday, Oct. 2, 2016. "This shouldn't be their normal" said J'vonte's mother Crystal Brown (not pictured). Dotson says the 14 year-old fired one shot at police who were chasing him, the police returned fire an unknown number of times hitting the boy.